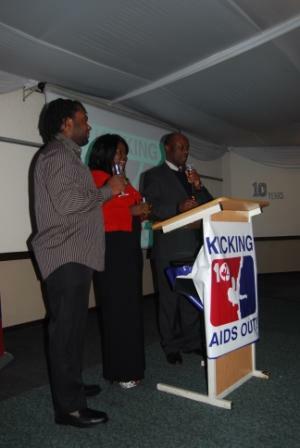 The Guiding Principles on Addressing Violence against Women in Sport were shared at the Kicking AIDS Out! 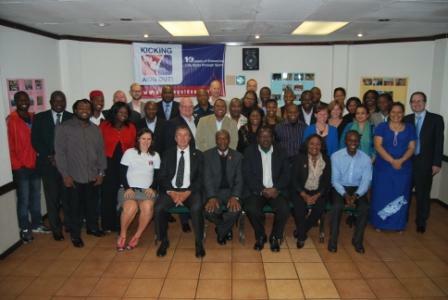 Network Annual General Meeting in Johanesburg on Thursday 25th August 2011. 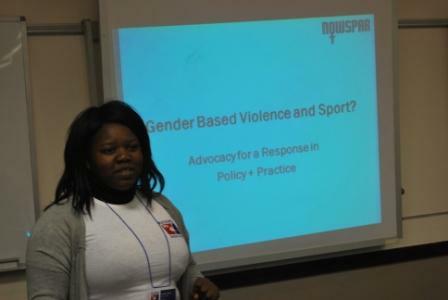 The Guiding Principles were developed in collaboration with NIF and Women Win to provide a policy framework for the Sport Sector to keep Gender Based Violence on the agenda as well as to develop practices that protect women and girls especially. In the presentation NOWSPAR General Secretary Ms. Lombe Mwambwa urged the Network members to consider what role they can play in proactively promoting a safe environment in sport as well as through sport. The Kicking AIDS Out meeting was attended by 33 people from 20 member organizations drawn from Oceania, Europe, Asia, Southern and Eastern Africa and North America including funding partners and practitioner organizations. It was agreed that the conversation will be taken forward and considerations made to explore process for integration of the principles shared in the practical operations and culture of the Network and its members. The International Kicking AIDS Out! Network celebrated its 10th Anniversary on 23rd August 2011 in Johanesburg at an event graced by His Excellency Lt. Col Bizwayo Newton Nkunika High Commissioner of Zambia to South Africa. 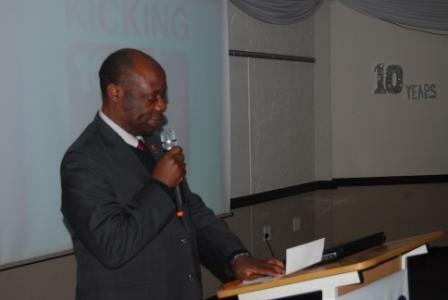 The Kicking AIDS Out concept was initiated by Zambian, Oscar Mwaanga and the Edusport Foundation. The Network has over the last decade developed into an International Network extending to Europe, South Asia, Oceania, North America and across South and Eastern Africa. 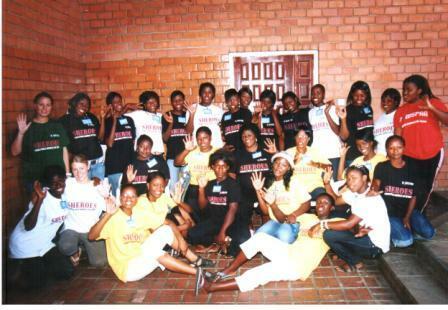 In Zambia the Network has a membership of 6 organisations including NOWSPAR, Edusport, Sport In Action, SCORE and Response Network and Kwenuha. The Anniversary Celebration was hosted by the Network Secretariate in South Africa and was a moment to reflect and celebrate the achievements and progress the Network has made as well as the contributions it has made to youth empowerment, to development of the Sport for development approach. Speaking at the event His Excellency Lt. Col Nkunika challenged the Network to move into the next decade with the vigor and passion that it faced the last 10 years. He commended the work that has gone into making the Network successful and especially for the strong focus on youth empowerment. In the Key Note address, Director of International Cooperation at NIF, Mr. Bjorn Omar Evu, shared the path the Network had taken in its development including the partnerships with NIF, Commonwealth Games Canada and UK Sport. He commended the contributions of the Network and concept pioneers including Oscar Mwaanga and several individuals. NOWSPAR General Secretary was MC at the event together with Ato Rockcliffe from Carebean. In the pic on the left, a toast was given by His Excellency Lt. Co. Nkunika to the Youth of the World and to the Kicking AIDS Out! Network. 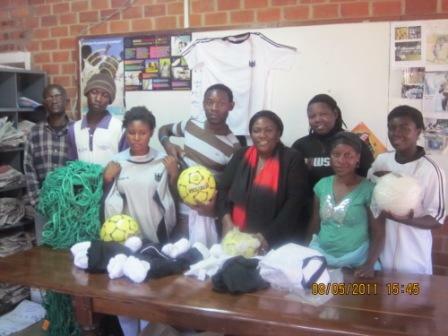 The Deaf Sport Development Organisation (DSDO) today was presented with football equipment to support their football program. The DSDO is a community based non-governmental organisation that is aimed at mobilising children, youth and adults with speech impairments to participate in sport and recreation. The DSDO is a member of NOWSPAR , this cooperation is aimed at enhancing opportunities for girls and women and also facilitating networking cooperation and shared advocacy for girls and women’s rights. Speaking at the handover ceremony at NOWSPAR, Ms. Mwaba was pleased to present the equipment to DSDO as they are an active group that is providing a platform for an under served part of our community- women and girls with speech impairments. She urged the organization to keep on with their work and called on the general public to encourage women and girls with speech impairments to engage in sport. On receipt of four balls for football and volleyball, a set of football goal nets, a set of jerseys and a ball pump, President of the DSDO Mr. Chilufya Chisanga (far left) thanked NOWSPAR for their partnership which has facilitated sharing of equipment. He was confident that the equipment will be motivating to the participants looks forward to having more girls involved in sport as well as the teams in his organisations playing more with other community teams. The donation ceremony was attended by some organization leaders, youth leaders and was covered by local TV station Mobi TV. 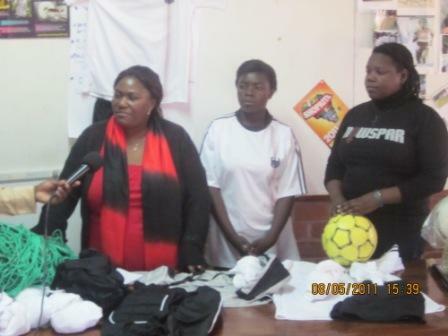 Ms. Mwaba thanked the German Embassy in Zambia for donating the equipment to NOWSPAR in an effort to promote girls participation in sport and football in particular. Germany this year hosted the 2011 FIFA Women’s World Cup.